Use the Collections Letter for Invalid Payment when a client's payment has been refused by their bank or card processor and their account is overdue. This Collections Letter for Invalid Payment is included in editable Word format that can be customized in Word or by using the included Wizard software. COLLECTIONS LETTER - INVALID PAYMENT. Work Order Number, Amount Due: Amount. We have attempted to contact you regarding the payment you made Insert Payment Information. Unfortunately, your Credit Card, Check, Bank, etc. where the problem exists declined the payment on Date. Your account with us is now overdue in the amount of Amount. We request that you contact us at Phone Number to make a payment in an alternate format. Thank you for your prompt attention to this matter. We always appreciate your business. 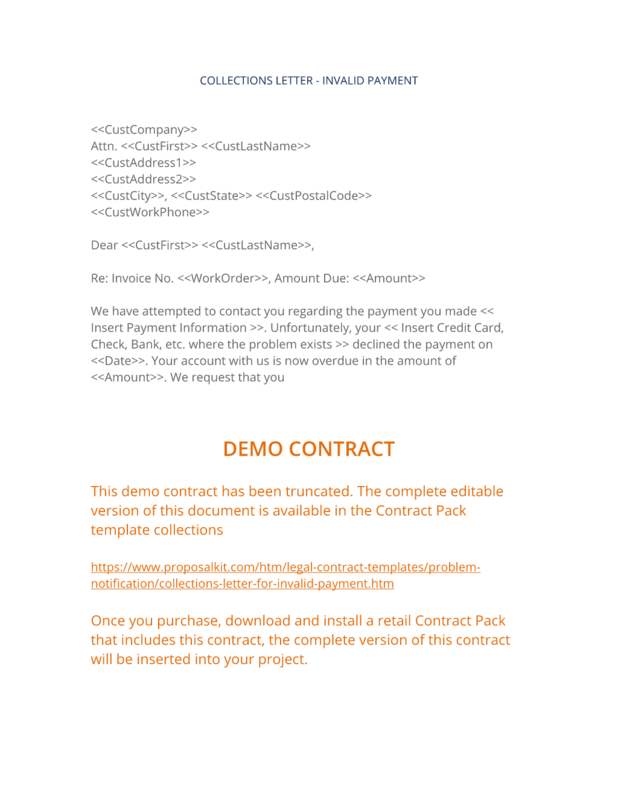 The complete Collections Letter for Invalid Payment - with the actual formatting and layout - is available in this Contract Pack.